Not-for-profit organisations can benefit from the same technology as for profit companies are using today. However CRM is not the only component to consider. The fourth focus area requires the most attention. Once you understand your Target Donor, it will shape how you develop your CRM/Contact Database, your Social Properties and your website. Once you understand your donor or supporter’s journey, you will be in a position to map it. Once it’s mapped, you can then look at ways of automating aspects of that journey. An automated onboarding campaign would bring together data from your CRM e.g. donation history, their interests etc plus a Marketing Automation platform will be needed to drive the engagement automatically. Delivering a personalised message en masse is impossible without a Marketing Automation platform. However, before you begin your own journey towards a technology solution, understand your donors or supporters, map their journey and develop processes to support their journey. There’s no point taking a broken manual process and automating it, it will just cause chaos faster! 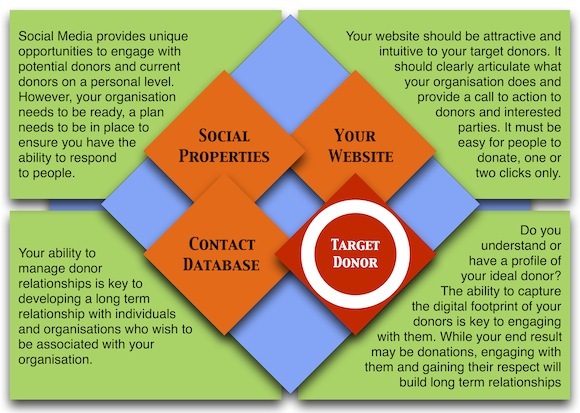 The diagram below maps the Donor Journey, a typical journey taken by all people as they move from a concerned citizen to a one-off donor. They may at some point change to a regular donor and perhaps over time leave a bequest in their will. Being able to capture a person’s digital footprint and then engage in a more meaningful and relevant way, will deliver better campaigns and a richer engagement overall.